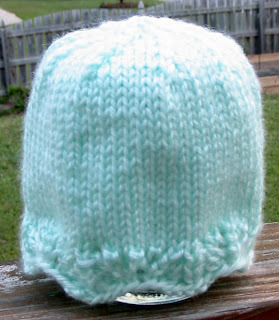 This very simple but very elegant preemie hat is made from a small amount of yarn, and is knit in the round on US5 (3.75mm) needles. It has one repeat of a simple lace pattern at the bottom, stockinette stitch for the body, and a 9-armed pinwheel crown. Join, being careful not to twist, and place marker before first stitch. Rows 1, 3, 5: Knit all stitches. Rows 2, 4, 6: [(K1; yo) twice, k3tog twice, yo, k1, yo] 7 times. 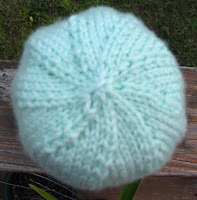 Continue working in stockinette stitch until hat measures 3.5in (9cm) from a point on the base. Row 1: (K5, k2tog) 9 times (54 stitches remain). Row 3: (K4, k2tog) 9 times (45 stitches remain). Row 5: (K3, k2tog) 9 times (36 stitches remain). Row 7: (K2, k2tog) 9 times (27 stitches remain). Row 9: (K1, k2tog) 9 times (18 stitches remain). Row 11: K2tog 9 times (9 stitches remain). Thread yarn tail through remaining stitches, slipping them from the knitting needles as you go. Pull yarn tail tightly to gather hole closed. Securely weave/sew ends to inside of hat.